Hard drives performances are important, a proxy service is able to store/retrieve Internet objects from hard drives. 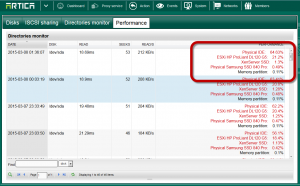 Artica test regulary your hard drives performances. Choose “Internal Hard drives” icon. For this example, hard drives performances are very poor. In our example: we should win 35% performances if our hard drive performance is correct. ESXi HP ProLiant DL120 G5: We have added a virtual machine on this computer and test performance. In our example, if we move to a Virtual Machine on this computer we should win 78% of performance. 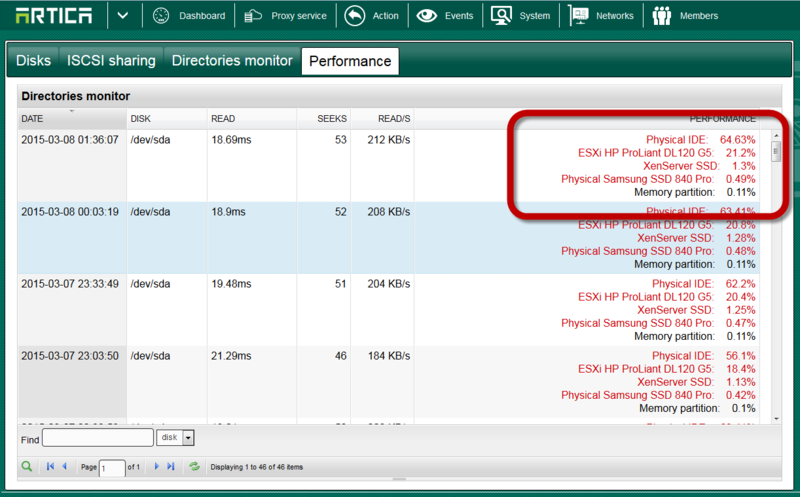 XenServer SSD: We have added a local SSD on an IBM Xen server , Intel(R) Xeon(R) CPU E3-1245 V2 @ 3.40GHz , Speed: 3392 MHz. In our example, if we move to a Virtual Machine on this server, we should win 98% of performance. Physical Samsung SSD 840 Pro: We have installed Artica on a Core i7 computer with 8GB of RAM and a Physical Samsung SSD 840 Pro. ← How to import logs into the statistics system ?